Got some bills you need pay and an RSVP postcard you need to answer weeks from now? Mail is something that can easily pile up and get lost in the midst of other paperwork. Homeowners need to designate a special spot to effectively handle the mail flow around the home. From a special shelf or cubby to an artistic indoor mailbox, establishing a mail processing center will help you to keep mail from cluttering your counter space and falling inadvertently into the trash can. Magazines may be fun to read, but, like junk mail, they can easily stack up and make a total mess. While tossing out the old and keeping only the latest issue is a practical solution, there may be some older magazines you’d like to save for reference (or maybe memory). Organizer bins or boxes are great because they can hide the clutter while blending in with your interior design. Home Storage Solutions also recommends magazine racks that are available as standalone, wall-mounted, or over-the-door. The kitchen should be a place of action! It is the place where healthy dishes are made and savory goods are baked straight from the oven. But as all great cuisine needs a set of great hands, quality foods cannot be prepared without quality cookware and tools. When organizing your kitchen, homeowners should store frequently used pots and pans near the stove. Appliances like coffee makers and rice cookers can be neatly positioned on the countertop for easy access. Put similar items together so you don’t need to open multiple drawers or cabinets to just fetch basic ingredients like salt, sugar, and pepper. Finally, label your spices and flour variety to avoid grabbing the wrong ingredient again. Our bookshelves can sometimes accommodate more than one row of books. The problem with maximizing your shelf space with two rows of books, DVDs, or CDs is that the second row tends to be completely covered by the first row. Just imagine the inconvenience of finding you favorite to read when it’s hidden behind a row of books! However, shelf risers have been able to solve this age-long dilemma. Designed with an adjustable riser on the bottom, a shelf riser can fit perfectly on the back of your shelf, while providing extra height to allow you a clear view of the second row. Coffee mugs can quickly take up cabinet spaces. Depending on the size of your coffee mugs, homeowners can use a spare wall to inspire a functional, but stylish coffee nook. You can install new shelves to create more space or transform an ordinary pegboard into an impressive mug display. Lastly, homeowners with unique, artistic coffee mugs can use them as home decors by showcasing a few of their proud collections on a special shelf or a wall-mounted rack. The irony about cleaning supplies is that they are also the culprit behind a cluttered bathroom. For a quick fix, group similar cleaning products together in organizer boxes of your choice. Put them on a cart to allow some mobility, especially when you need to move a number of them from Room A to B. If your home’s cleaning products are relatively small and in bottle sizes, you can get creative and use a shoe organizer. A shoe organizer may not be intended for your cleaning supplies, however, it comes handy when storing all of those cleaning supplies that you’ll need at a moment’s notice. If you live in a household where each member has his or her own favorite brands, then your bathroom is doomed for clutter. With two to three different brands of shampoos, conditioners, toothpaste, and soaps, it will be difficult to accommodate all these personal items in a limited counter space. Thanks to shower curtains customized with mesh pockets, everyone can keep his/her favorite brand of spa collection and still be squeaky clean. Customized shower curtains today are available with pockets of various sizes for you to store your bath essentials, bath toys, combs, and more. Simply assign a pocket or two to each person and your counter space will suddenly have enough room to display a family photo or a pot of flowers. Organizing your bedroom can sometimes be tricky especially when you are trying to evoke a spacious and open atmosphere. With your dresser, closet, and other storage space already overcrowded with stuff, it’s time to store a few things under the bed with a few smart storage solutions. Homeowners need to be inventive and innovative when it comes to decluttering your home. However, you must be wary of where you’re storing all of your items. You can use the space under the bed to store unsightly items like shoes and books. 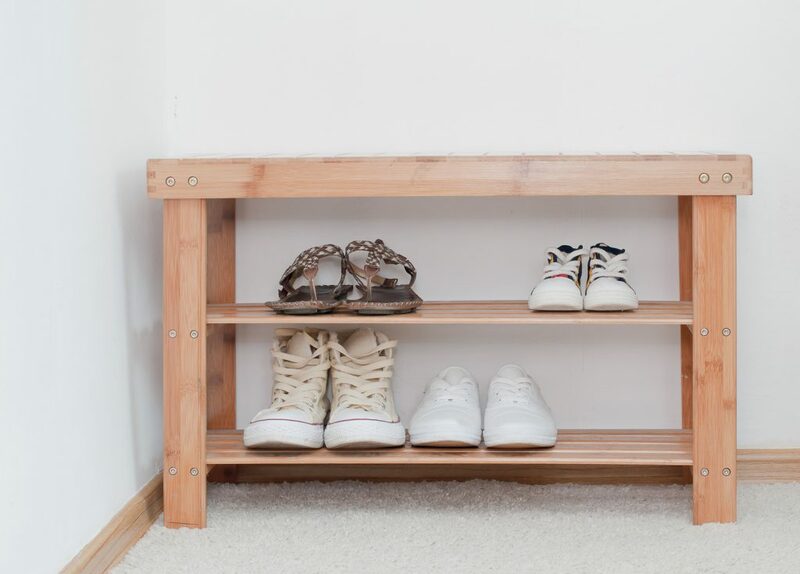 You can stack up the books in neatly categorized piles or use a shoe rack to arrange your shoes. Yet, you don’t want to throw everything under your bed just to conceal it from visitors’ eyes. The folks at The Painted Home took the game to a different level when they used old drawers to sort miscellaneous items and stored them under the bed. There are many tools on the market to help you maximize under-the-bed storage. For example, the under-bed wheeled boxes and drawers are extremely helpful. They are intelligent storage solutions, while the wheels on the bottom make it easy for you to take the boxes/drawers from under the bed without pulling a muscle. 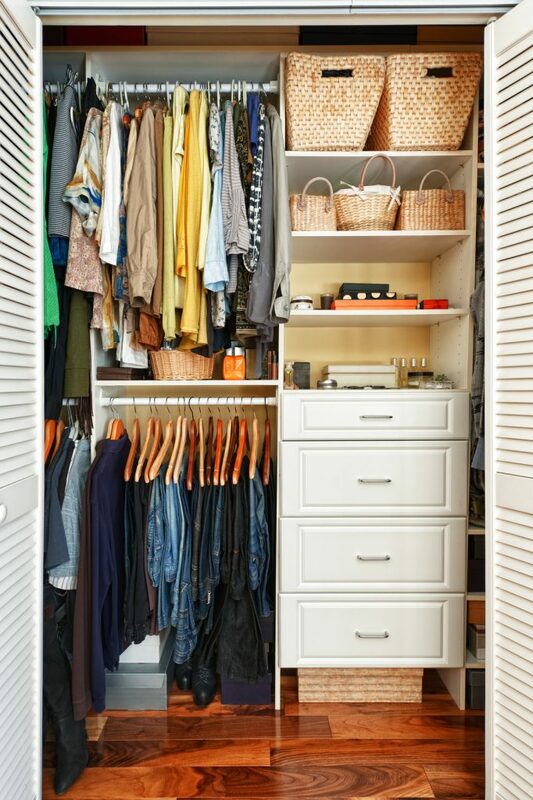 Are you running out of closet space? Then use the back of your door to hang your go-to jacket, coat, purse, or favorite jewelry. The back of your bedroom door can be used for storage. From creatively using your shoe holders to organize your kitchen spices or makeup collection to setting up a hanging rack to display your craft supplies, the back of your doors can become a true storage place if you will just be bold and experiment the endless organization potentials. If you have enough ceiling space, homeowners should consider installing a shelf or rack right over your door. The rack can be a handy spot to put away unused towels, pillows, and bed sheets. As with all things in life, thinking outside the box usually, brings you unexpected but pleasant results. The same applies to furniture that can meet more than one need. For example, instead of having a traditional kitchen island that serves as a standalone, single-purpose structure, a workhorse island not only enables you to display food on the top but also yields plenteous storage space for your cookware below. When it comes to small bedrooms, a loft bed is widely hailed as a space-saving solution. Loft beds are instantly reliable, especially for small bedrooms as it opens up floor space for the room. Depending on your preference, the space underneath the loft bed can be transformed into a nerdy nook or a relaxing hub. 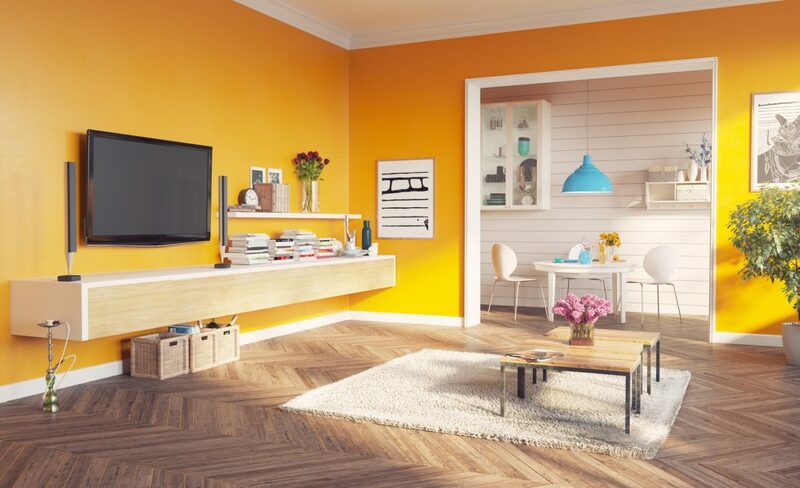 You can store toys, books, or even put in a desk to create a personal office space. Whether it’s utilizing the space under your bed, the back of your bedroom door, or using items around the house to store your cleaning supplies, there are plenty of ways to organize your home. Get started on decluttering today! Great tips. I find that I tend to do my organization in waves. I let things pile up for a couple of days then I go through a big rush of knocking things off my life and organizing. Not saying this is the ideal process, but just how I find myself working. I think there is always some room for optimizing and further organizing. Thanks for checking out my article and commenting! I agree it’s really hard to get into the routine of organizing every day. The feeling of productivity you get from knocking out a large pile in one sitting always leaves me with a sigh of relief and satisfaction!